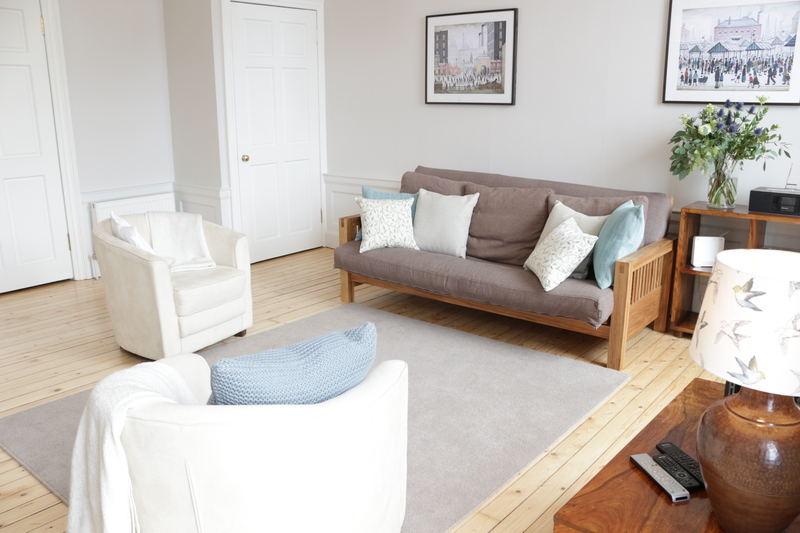 41a Broughton Street is a pretty, pastel, serene apartment in the heart of the East New Town. Owned by the delightful Rebecca & Devan who bought the property back in 1996 after looking for their first home together. Devan was already living around the corner on Broughton Place and Rebecca had previously lived on Dundas Street, so they knew the area well. It took them three months to find the right place, after looking at numerous other properties including one where the kitchen was a sink and single ring hob tucked away in an Edinburgh press (which is like a large cupboard)…it wasn’t for them. As soon as they viewed 41a Broughton St, they knew this was it. They loved the light and proportions of the front room and the views across to the Firth of Forth. Broughton used to be a separate village but as the New Town developed it was absorbed into the city of Edinburgh. Their block was the first of the Georgian houses in Broughton Street, built around 1808. Back in the day, the tenements had outside bathrooms, so when bathrooms were installed inside, they were often crammed into small rooms. Luckily, this flat has a perfect-sized, modern bathroom and a neat galley kitchen alongside the rather grand living space. As the original tenements were modernised and subdivided over time, each has a different layout which adds to the charm. Over the 19 years Rebecca & Devan have owned the flat, it has evolved with them. When they first bought the property it had very old wiring, dated décor and no central heating. Their first winter was spent in the living room because it had a small gas fire, so making it warm was their first priority! By the time of the second renovation, they had a young family so focused on practical comforts, modernising the kitchen and bathroom. For the most recent renovation they wanted to lighten the colour scheme to make the most of the lovely light in the flat and reinstate some of the traditional features. 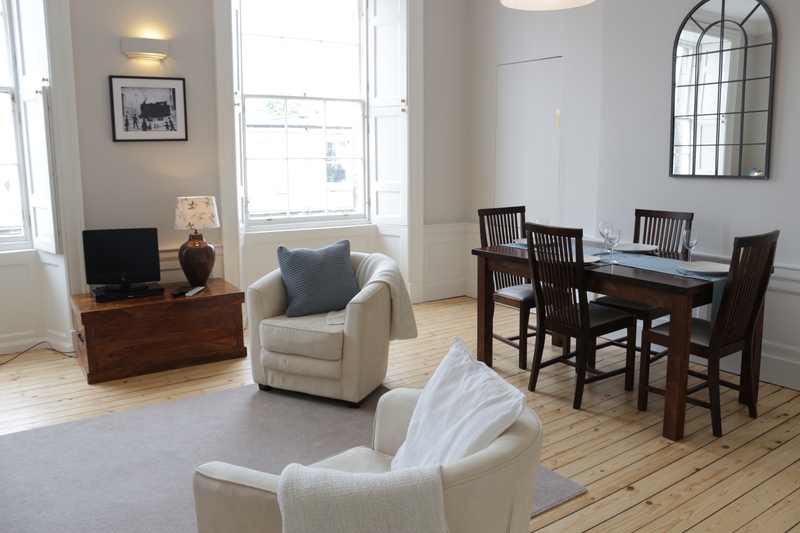 They had the floorboards sanded back to their original colour and refurbished the beautiful sash windows to bring the shutters in the living room back to working order. These were an original feature but the central leaves had been removed and the shutters nailed into the casement by a previous owner. When the windows were taken apart, hidden in the side was an invoice from the last refurbishment in the 1950s. Rebecca praises the smooth running of the renovation down to the fantastic people that worked on the project and particularly in the marshalling skills of Simon Brook who Project Managed it for them. In 2008, work commitments meant Rebecca & Devan ended up moving to Singapore and then to London. Still with strong ties to Edinburgh, they wanted to keep the flat so they could come back as often as they could to visit friends and old haunts. Holiday and short term letting was the obvious choice. 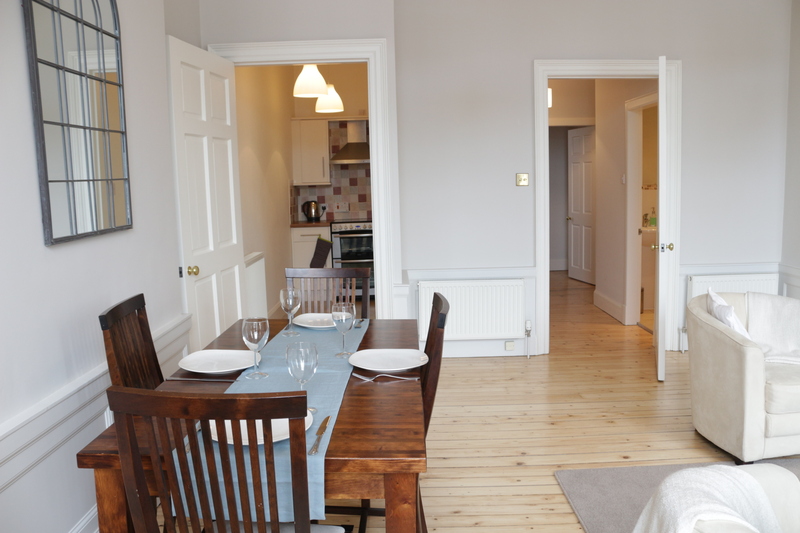 It’s a great base for exploring Edinburgh and short term lets give them the flexibility to still enjoy the property when they get the chance. 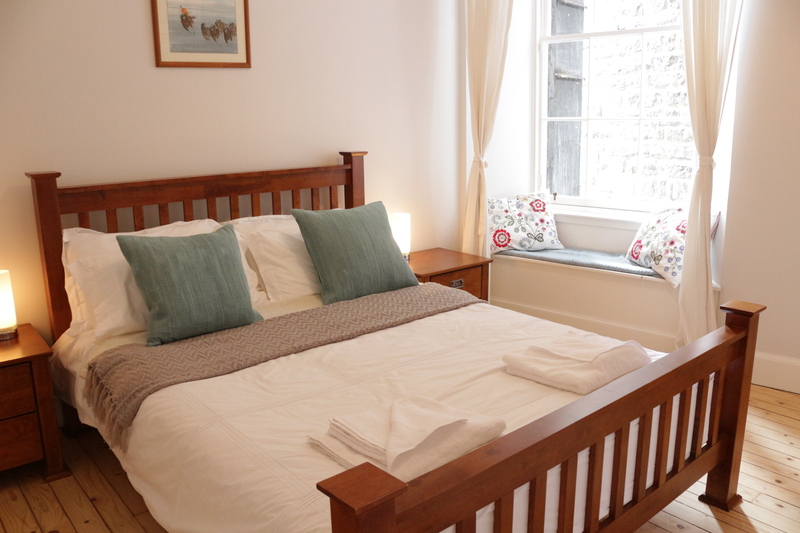 We think you’ll agree this is one of the prettiest apartments and one that guests have enjoyed time and time again.